Four years after launch from Cape Canaveral, NASA's ion-drive Dawn spacecraft is finally in orbit around the asteroid Vesta, studying the second largest body in the rubble-strewn belt between Mars and Jupiter in unprecedented detail. Pictures released Monday show a strangely tortured world with huge parallel grooves separating the heavily cratered northern hemisphere from smoother terrain in the south dominated by the chaotic remnants of a catastrophic impact. "These photos have been already a great revelation to the team about what the surface is like," said Christopher Russell, the mission's principal investigator. "We did not imagine the detail we're seeing and the various processes that we're seeing evidence of now. These are really insightful into this building block of the early solar system. ... It's really a beautiful and exciting small world sitting there in the middle of the asteroid belt that we're going to learn very much about." Discovered in 1807, Vesta is roughly spherical, measuring about 359 miles by 285 miles. It is the largest member of the asteroid belt yet visited by a robotic spacecraft, second in size only to Ceres, Dawn's next target and, along with Pluto, one of just five known dwarf planets. NASA is spending $466 million to explore Vesta and Ceres during the course of a 10-year mission. 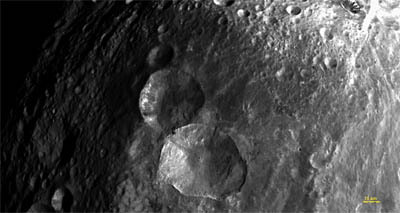 Vesta's surface is believed to be made up of basaltic rock which flowed out of a presumably hot interior when the asteroid formed some 4.5 billion years ago. Because of its small size, the asteroid presumably cooled quickly and did not undergo subsequent resurfacing like larger worlds. 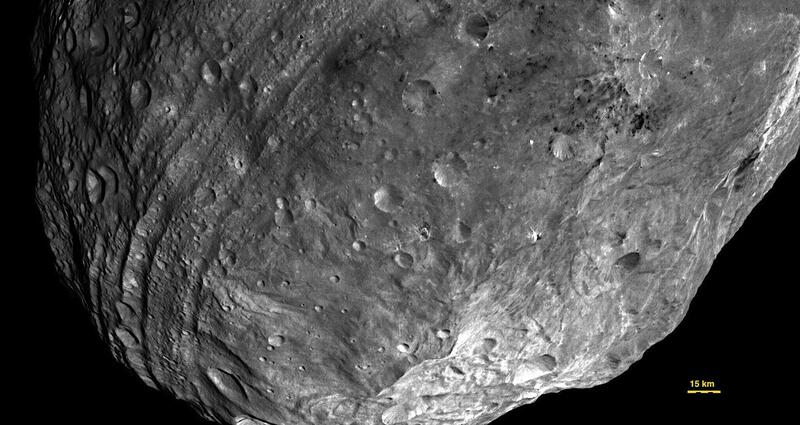 As such, Vesta may have one of the oldest, most pristine surfaces in the solar system, a frozen snapshot of the materials and conditions that existed at the dawn of the solar system. "We believe this goes back to the first five million years of the solar system," Russell said. "What happened back then was that the material that was orbiting what was going to become the sun began to condense. We have evidence of what was going on through very primitive meteorites that have fallen to the Earth. "Right when Vesta started to come together, we believe there was a supernova that irradiated the material and added radioactive material to it that when the material came together, it had an additional heat source and some of these bodies that were formed melted and then differentiated, they made a crust of lava and an iron core. Those are some of the oldest bodies out there." Earlier observations by the Hubble Space Telescope showed what appeared to be a titanic impact crater near Vesta's south pole that stretches some 285 miles across and measures some eight miles deep. More than 200,000 cubic miles of debris were blasted into space, according to the Dawn press kit, some of which eventually made its way to Earth as meteorites. To put the impact into perspective, a proportionately sized crater on Earth would be roughly the size of the Pacific Ocean. Images from Dawn show chaotic terrain near the south pole dominated by a towering central peak and huge ripple-like grooves stretching around the asteroid's equator. Terrain north of the grooves is much more heavily cratered. 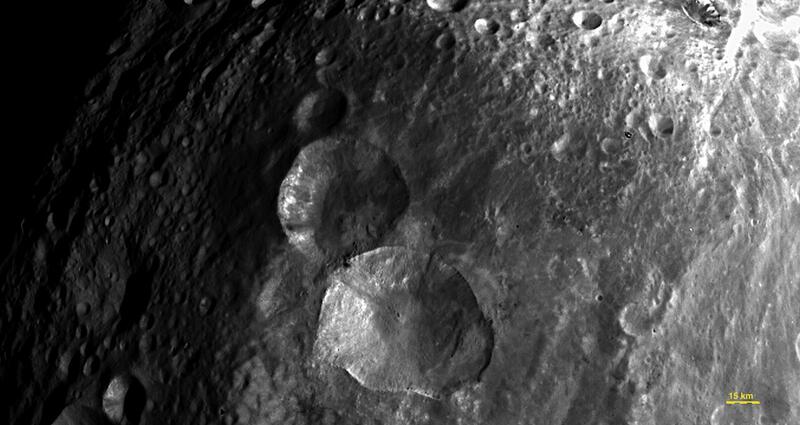 "Those grooves are pretty much in the equatorial region and they're very much perpendicular to the direction we think the impact was going when it struck Vesta," Russell said. "So one thing it could be is that when the compression of that fantastic impact came, Vesta got smaller in that direction for a while and then expanded and that caused tectonic features around the equatorial region." Launched atop a United Launch Alliance Delta 2 rocket on Sept. 27, 2007, Dawn is the first operational deep space mission to be equipped with an ion propulsion system. Instead of burning liquid propellants in short, high-power bursts, Dawn's propulsion system works by using electrical power to ionize and accelerate electrically charged xenon to velocities 10 times greater than the exhaust from chemical rockets. Dawn's ion propulsion system "only pushes on the spacecraft as hard as this single piece of paper pushes on my hand," said Marc Rayman, mission manager and chief engineer, holding up a single piece of paper. "And yet gradually, over time, the effect of this whisper-like thrust can build up and produce fantastically high velocity. So this is what I like to call acceleration with patience. And now, our patience is paying off very handsomely indeed." "Thanks to all the thrusting we've been doing all along the way, Dawn was able to slowly creep up on Vesta and slip ever so gently into orbit with the same grace and elegance it's displayed in nearly a thousand days of inner planetary ion thrusting," Rayman said. Dawn's initial orbit around Vesta carries it over the astroid's poles at an altitude of roughly 1,700 miles. The orbit's orientation keeps the spacecraft and its huge solar panels in direct sunlight to provide power for its instruments and its propulsion system. Traveling from north to south, Dawn will complete one orbit every three Earth days. Because Vesta completes one rotation or "day," every five hours and 20 minutes, Dawn will be able to observe the asteroid's entire illuminated surface every orbit. During south-to-north passes above Vesta's night side, Dawn will transmit stored images and other data back to Earth. Operating in the initially high survey orbit, Dawn's instruments will provide a global view of Vesta in ultraviolet, visible and infrared wavelengths. A mapping spectrometer will observe the surface with a resolution of 2,300 feet per pixel while the spacecraft's visible-light cameras will resolve features as small as 820 feet across, about 150 times better than images taken by the Hubble Space Telescope. Dawn's gamma ray and neutron detector will help researchers characterize the surface composition of Vesta while analysis of subtle changes in the spacecraft's radio signal, caused by slight changes in Dawn's orbital velocity, will help scientists map out the asteroids gravity field and internal structure. After seven orbits, or about three weeks in the survey orbit, Dawn's ion propulsion system will spend a month or so slowly lowering the orbit to an altitude of about 420 miles, allowing the spacecraft to circle the asteroid twice each Earth day. Dawn will complete about 60 trips around Vesta in this so-called high-altitude mapping orbit, or HAMO, surveying the asteroid in extraordinary detail, allowing scientists to build topographic maps showing the elevation of hills and mountains and the depths of the craters dotting its surface. After HAMO operations are complete, Dawn will spend about six weeks dropping down to a low-altitude mapping orbit, or LAMO, at less than 110 miles, circling Vesta every four hours. While the lower orbit will give Dawn's cameras sharp views of Vesta's surface, the primary goal of this 10-week phase of the mission is to allow the gamma ray and neutron detector to monitor cosmic ray impacts on the surface. High energy cosmic rays hitting atoms in the upper three feet of the surface will release gamma rays and neutrons that can be used to determine the identities of the original atoms. 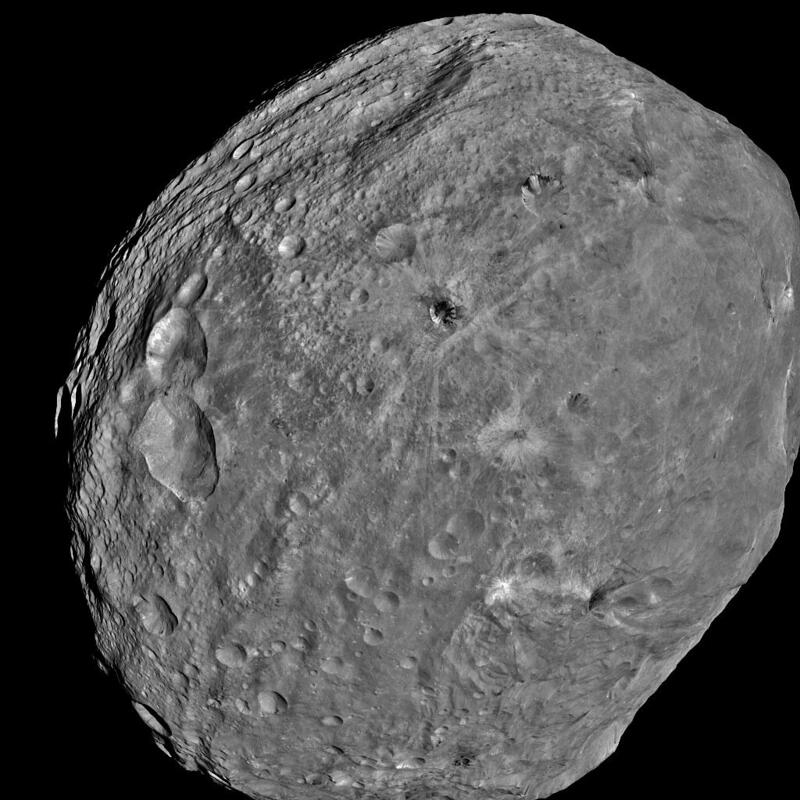 The effects of Vesta's gravity on Dawn's orbit will be more pronounced in the low-altitude orbit, allowing scientists to map out its internal mass distribution. When the low-altitude phase of the mission is complete, Dawn will spend another six weeks spiraling out for a second set of observations at an altitude of 420 miles, identical to the earlier high-altitude mapping orbit. Because about eight months will have passed between the two sets of observations, more of Vesta's northern hemisphere will be illuminated as the asteroid's seasons progress and areas not seen earlier will be mapped at the same level of detail. If all goes well, Dawn will begin its departure from Vesta in June 2012, setting off on a two-and-a-half-year voyage to Ceres. The mission is funded through July 2015.